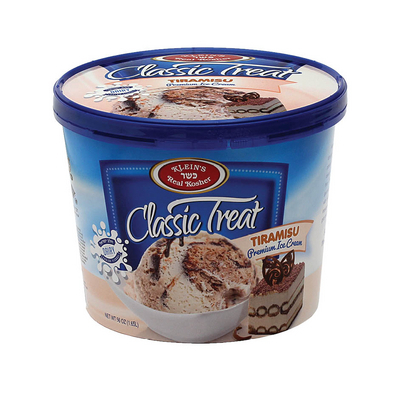 Klein’s all time favorite tiramisu flavor finally available in convenient 56oz containers. Tiramisu is a fabulous blend of coffee and chocolate ice cream with scrumptious chunks of sandwich cookies all swirled together in a heavenly duet! Ingredients: Skim milk, cream, sugar, chocolate ripple (high fructose corn syrup, sugar, water, corn syrup, cocoa [processed with alkali], modified food starch, chocolate liquor, salt, natural and artificial flavors), corn syrup, chocolate sandwich cookies (flour [bleached wheat flour, niacin, reduced iron, thiamin, mononitrate, riboflavin, and folic acid], sugar, partially hydrogenatedsoybean and /or cottonseed oil, dextrose, corn syrup, cocoa [processed with alkali], cornstarch, salt, sodium bicarbonate, ammonium bicarbonate, soy lecithin, natural and artificial flavor), coffee extract (water, extract of coffee beans), contains less than 2% of: carob bean gum, guar gum, cellulose gum, mono & diglycerides, propylene glycol alginate, carrageenan.